The "Préface-Annexe" to La Religieuse famously explains how Diderot's work was inspired by an elaborate hoax played on one of his friends, the marquis de Croismare. The kindly marquis had previously interested himself in a court case in which a nun had petitioned to be released from her vows; a second, fictitious nun was now invented in order to entice him back to Paris from retirement in his château near Caen. The ploy was unsuccessful and the details of the conspiracy and its relation to Diderot's fiction are contested; but the original nun was undoubtedly real. The case was heard between 1752 and 1758 before both the ecclesiastical and civil courts and involved a nun from Longchamp called Marguerite Delamarre. The Diderot scholar George May has unravelled the details. Marguerite Delamarre was born on 9th January 1717, the eldest child of Claude Delamarre, a Parisian goldsmith and jeweler, and his wife, whose name was also Marguerite. The family was of somewhat lower social status than that of Diderot's Suzanne Simonin, whose father was a lawyer; but it was on the ascendant. In 1722 Claude Delamarre bought an estate near Brie-Comte-Robert for 100,000 livres and in 1729 a town house in Paris. Finally, in 1732 he was able to purchase an ennobling office as a secretary to the Parlement of Bordeaux. Unsurprisingly, issues of money and inheritance featured large in Marguerite's story. Soon after her birth the child was farmed out to a wet nurse in Auteuil, then passed her girlhood in a succession of convents. On 23 May 1720, when still only three, she became a pensionnaire at Longchamp. She stayed only nine months before being sent to the convent of the Ursulines at Chartres where her maternal aunt had retired. In 1724, following her aunt's death, the seven-year old was brought back to Paris and became a pensionnaire with the Visitandine nuns of the rue du Bac. This is the same "couvent de Sainte-Marie" that Diderot specifies as the first convent of Suzanne Simonin, which she enters "in high spirits" since her home life has been so miserable. It was a flourishing establishment with eighty nuns, servants and pensionnaires, and had a reputation for providing good education for young girls, with masters of music, geography and drawing in its employ. Although it is easy to assume Marguerite suffered emotional neglect, the child was therefore adequately provided for - the pension at rue du Bac was 500 livres per year - and her situation was not so unusual for the time. As Madame Delamarre explained later, with some plausibility, she had no time for her daughter since she was fully occupied with the burden of looking after her husband's business. Nothing so far suggested that Marguerite was intended ultimately for the religious life. Events now took on a more sinister turn. In 1732, at age fifteen, Marguerite Delamarre was duly taken out of the convent and a marriage arranged for her to one sieur de Gennes. According to Madame Delamarre the dowry (of 60,000 livres) and other financial arrangements were in place and the marriage was impeded only by her daughter's "irresistible vocation". Marguerite, however, claimed that her mother wanted to safeguard her claim to her husband's business and had never intended the marriage to take place; she spread rumours that the couple had indulged in an illicit liaison, that the girl might even be pregnant and, having subjected her to a humiliating examination, incarcerated her at home. 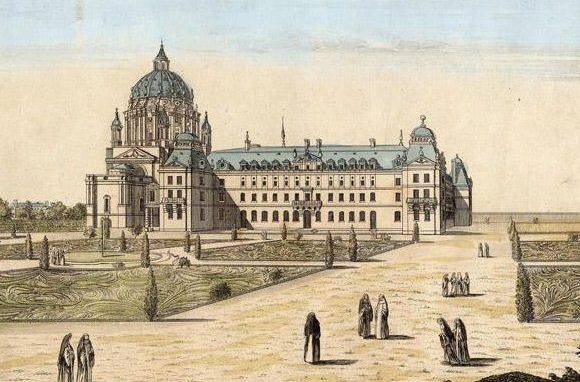 Faced with the choice of the cloister or confinement in a maison de force or the Hôpital-Général, Marguerite opted to enter her fourth convent on 16 June 1732. Suspiciously it was at this very time that her father, having saved on her dowry, laid out 35,000 livres for his post of secretary to the Parlement of Bordeaux. Marguerite now found herself among the Benedictine nuns of the abbey of Val-de-Grâce in Paris, this time no longer as a pensionnaire but as a postulant. After two years, the request was made for her to be transferred to a less austere order. According to Marguerite, the initiative came from the convent itself. She had previously been refused by two other establishments who had recognised that she was acting under duress. After the trial, in 1758, she succeeded in acquiring a certificate from the nuns of Val-de-Grâce confirming that they had refused her entry to the profession "because they had always recognised that she had no vocation and that she had entered only through constraint". Due to the time which had lapsed, however, this testimonial was never admitted in evidence. On 20th July 1734 Marguerite Delamarre was moved to the abbey of Longchamp. She was still only seventeen. She explained that she had resigned herself to her fate and duly took the habit and made her profession. She was to stay at Longchamp for fifty-five years, until the Revolution. Everyone agreed that the rule at Longchamp was not rigorous but one can only imagine - as Diderot did - the reluctant nun's state of mind. According to the nuns interrogated in 1756 Sister Delamarre took to fantasising an illegitimate birth and claimed to be the long lost daughter of the duchesse de Berry, substituted as a baby by her wet-nurse. She herself claimed that she had been prevented from seeing her three younger brothers; spied on by other sisters and restricted in her choice of confessor. It was not to be until almost twenty years later that Sister Delamarre was finally able to take action. On 2 September 1752 her petition for release from her vows was deposed before the Officialité de Paris, the presiding ecclesiastical court for the diocese of Paris, and six years of judicial proceedings were set into motion. A memoir by Briquet de Mercy, the advocate for Madame Delamarre. printed in 1755, named the person who had initiated the move - and it is an interesting one. Her benefactor was none other than the inventor Jacques Vaucanson, the royal inspector of silk manufactures, who had visited the convent at Longchamp, in order to install equipment for the production of silk. He had been chaperoned for the occasion by one Mlle Biche, said to be his niece, and it was through this intermediary that Marguerite Delamarre had managed to communicate with him. 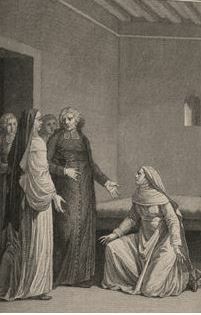 Vaucanson had entered into a series of negotiations with the abbess and the widow Delamarre, without result. According to one source he had even entertained a mechanical device to facilitate the nun's escape. In the middle of 1752 he appealed to M. Courlesvaux, the procureur of the Châtelet and proceedings were duly instigated, presided over by the Vicar-General of the diocese of Paris, Nicholas Regnault. After preliminary depositions, on 28 March 1753 Marguerite herself was interrogated; there were further deposition (five in total); Madame Delamarre and the nuns were interrogated and on 28 the final verdict reached; Marguerite's petition was turned down. In January 1758 a new memoir was drawn up and the case appealed. From this point onwards the affair was no longer the concern of the ecclesiastical courts but came under jurisdiction of Parlement of Paris. It is probably at this point that it was first talked about in Paris and the marquis de Croismare got to hear of it. According to the "Preface-Annexe" he intervened personally, approaching "all the counsellors of the Grand' Chambre". No mention is to be found in any printed journal or paper for the time, but it was no doubt a topic of conversation in circles known to the Encyclopédistes. Vaucanson frequented the Farmer-General Le Riche de La Popelinière, as did Marmontel and d'Alembert; Grimm too would have known about events. According to the "Préface-Annexe" it would appear that the marquis de Croismare intervened without knowing any of the details. Diderot at least knew Marguerite's name and two of her convents. Marguerite Delamarre again lost her case. A plea entered by Briquet de Mercy on behalf of his client suggests that the verdict was motivated not so much by the evidence as by fear of setting an awkward precedent. If the case were approved, writes Briquet de Mercy, there would be "trouble and disorder" in families and "revolt and confusion" in the Cloisters: monastic vows were a sacred promise made to God, and religious duty should not be compromised by the "seductive language of the Century" (May, p.285). There is only one further glimpse of Sister Delamarre in the historical record. On 7 June 1790, following the the Revolutionary dissolution of monastic establishments, the mayor of Bologne carried out an inventory of Longchamp. This document gives the names of eighteen nuns present in the abbey, but Marguerite's is not among them. However another list from July 1790 has details of nine nuns who had been evacuated to dependent houses elsewhere and among them is "Marguerite de Lamarre, 73 ans, à Notre-Dame de Meaux-en-Brie". Her subsequent fate and final resting place remain unknown. Georges May, "Le modèle inconnu de "La Religieuse" de Diderot: Marguerite Delamarre"